The Pacific National Exhibition (PNE) is excited to continue its Community Grant Fund for local Hastings Sunrise non-profit organizations or recognized community groups to apply for funding to host a free, fun, and accessible event or program for the local community. The Community Grant program was established with the purpose of growing community pride. Providing opportunities for the Hastings Sunrise community to come together, learn, engage, and enjoy! This year’s Community Day at Playland is happening on Saturday, May 25, where $10 from each purchased regular priced ticket will go towards the PNE Community Grant Fund (to a maximum of $10,000). Submissions for grants between $100 to $3000 will be accepted between March 11, 2019 to May 3, 2019. Please read the 2019 Community Grant Fund Information Guide (PDF) in full before submitting your application. The Pacific National Exhibition (PNE) positively impacts the community through an award winning community outreach program. 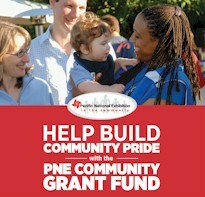 With a strong future in place at Hastings Park, the PNE is committed to continuing its proud tradition of giving back. The PNE donates tickets in support of fundraising events benefiting charitable, community, educational, sports, and non-profit groups across B.C.